The 2009 CIAA basketball tournament kicks off two weeks from today, February 24-28, and for the fourth consecutive year it will take over uptown Charlotte. I moved here about six months before the first tournament came to Charlotte so I've witnessed it grow. The number of people visiting and amount of money being pumped into the local economy has set records each of the last three years. The recession is sure to have an effect this year, but I don't think it's going to slow down the partying. 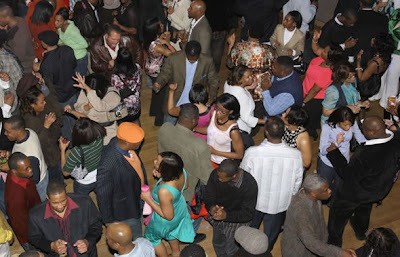 The thing about CIAA Week is that for five or six consecutive days Charlotte is a non-stop party scene: day parties, after parties, concerts, fashion shows, live broadcasts from syndicated radio shows, and celebrity appearances galore. 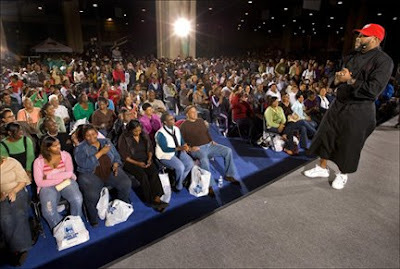 The CIAA puts on its own official events including a step show, concert, health forum, career expo, and fan experience in addition to the men's and women's basketball teams from 10 historically black colleges and universities (HBCUs), including Johnson C. Smith University, competing for the conference championships. But it's the non-CIAA sanctioned events that dominate the week. Seems like every party and event promoter in town--and beyond--is planning something, renting out just about every bar, lounge, nightclub, and hotel ballroom in uptown. I'm literally receiving five to ten emails a day about events going on that week. Instead of me trying to post them all, I'm going to bow down to the great and extensive list compiled by The Charlotte Observer's entertainment reporter and "Paid To Party" columnist Sarah Aarthun. She has more than 100 events listed now and I'm sure the number will increase as we get closer to the start of the tournament (see link below). What I will do here on Grown People Talking is list the events I recommend in my "Events for the Week" leading up to CIAA Week. With so many events for you to try and decipher, I'll suggest the ones I think are worth your money (they do get pricey), based largely on the reputation and past results by the particular promoters and venue. Because anyone can throw together a nice-looking flier, but all parties aren't created equal. I'll also post a Celebrity Counter on this site that lists all of the celebrities that are scheduled to come to Charlotte, many of whom will be hosting parties. Last year's celebrity sightings included: Floyd Mayweather Jr., Steve Harvey, Fat Joe, Doug E. Fresh, Jermaine Dupri, Idris Elba, Morris Chestnut, MC Lyte, Bow Wow, Lil Kim, and many more. Keep your autograph book and camera phone in hand. If you do party it up this year, be safe and have fun. But also be sure to check out a basketball game or two at Time Warner Cable Arena. I had great seats to last year's championship game and was able to sit near several celebrities. Plus, the game was enjoyable, too. College basketball always is. This is why the CIAA wants to put the focus back on basketball--this year's theme is "Rock the Rim." Show your support by attending a game--after you leave a day party. Click here for the official CIAA Tournament website, which includes conference-sponsored events and info on lodging, parking, and dining. Click here for the Paid To Party list of events taking place, more than 100 of them so far.